My student teacher's last day was yesterday, and I wanted to give her something from the class that would be a treat and could be a keepsake too. So this bouquet has one flower for each student, and when you turn it around, it is a bouquet of 2nd graders' smiling faces. With a couple of Dimensionals on each side of the skewer, I attached a school picture of each of the kids, and the center flower says "Hugs and Kisses from your second grade bunch". We gave her a few more goodies including her own set of teacher stamps, and each of the kids wrote her a letter. It's always interesting to read their favorite memories and bits of advice. Another teacher and I were in charge of gifts for our secretaries. She bought the flowers and I made the cards. A little 3 x 3 card is just right as a tie-on to say thanks for all you do! Click here to see the list of Stampin' Up! accessories that are retiring. These products are only available while supplies last. Click here to see the list of the previously posted retiring stamp sets. These stamp sets will be available until the end of May, and our new catalog come out a month early - June 1! I have been working on embossing folder techniques the last few weeks for a demonstration at our annual Spring into Stamping event over in Champaign. The group of stampers I belong to is just such a great group, it was like our own mini regional event. So I have plenty of samples to share with you!! I will be back with more impressive looking but easy to make cards like this one, and I will have some directions for you too! I will also have the latest projects from my April stamp club to share. This card happens to be both - it was a club project and one of my featured techniques in my demo. Aren't these Petite Purses cute? The Big Shot die and designer series paper are part of the Summer Smooches suite that is available in April before the new catalog June 1. The purses go together pretty easily which would make them great for party favors. We made these in club last week and covered some Hershey Nuggets with our paper scraps to tuck inside. 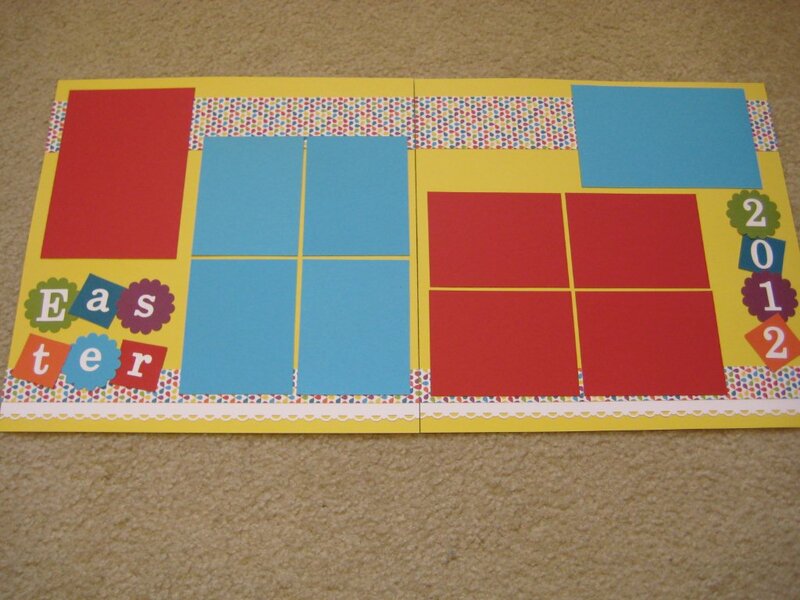 For this week in scrapbook club, I planned a layout that can be changed to meet the needs of the ladies in the club. Not everyone has a lot of vertical or horizontal pictures. So I took my inspiration from a Got Sketch? sketch. It was a single page layout, and I just rotated the page to make room for both horizontal and vertical pictures. 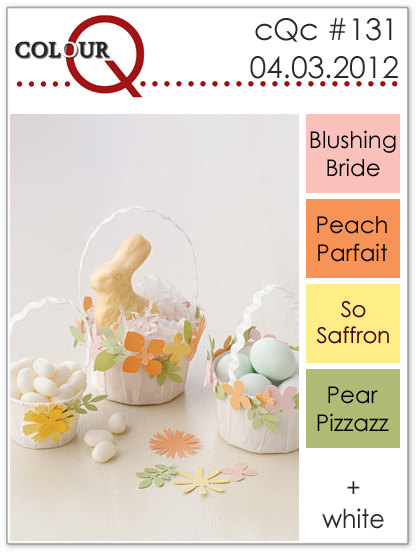 We are using the new Summer Smooches Designer Series paper which will give everyone a lot of choices. You can shop my online store for your own Summer Smooches DSP and other great products in that suite before then end of April. If you miss it, you will have to wait until the new catalog comes out June 1. Here is one of tonight's stamp club projects. It's one of the best kinds of cards - it really is pretty easy but looks impressive! I started out with the Twitterpated Designer Series Paper and picked my colors from there. Cut two 2 5/8” squares of Blushing Bride. Attach so that eight points are showing. Punch four 1 ¼” squares in one pattern of Designer Series Paper and four 1 ¼” squares in a complementary pattern. Apply adhesive to one corner of each square. 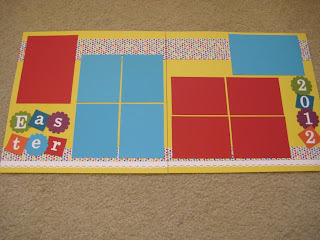 Attach each square by alternating every other pattern placing adhesive in the center each time. Our new catalog is coming out June 1 this year - that's a month earlier than usual. So to make room for new stamp sets and products, Stampin' Up! is retiring some old favorites. Starting today, the following stamp sets are set to retire May 31 but will be available until then. Click here for the PDF version of the list. Check back for the retiring Definitely Decorative and retiring accessories lists - available April 25. You'll want to act fast on those as they will only be available while supplies last. 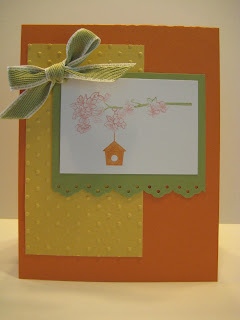 I had a house full of stampers last night at my May Stamp-a-Stack and here's one of the cards we made. I copied it pretty closely from a card that was on the one of the display boards at convention last summer. Though I have had this stamp set for some time, I had never used it with my stampers so it was a new one for them! The stamp set Teeny Tiny Wishes made it easy for everyone to pick the right greeting. Here's my tweaked version of the card I posted on Friday. We will be making this at my next stamp-a-stack. The theme is all occasion cards, and I thought this card could be used for a number of occasions. The stamp is from the Up in the Air stamp set that is available to hostesses only through the end of the month in our Occasions Mini Catalog. 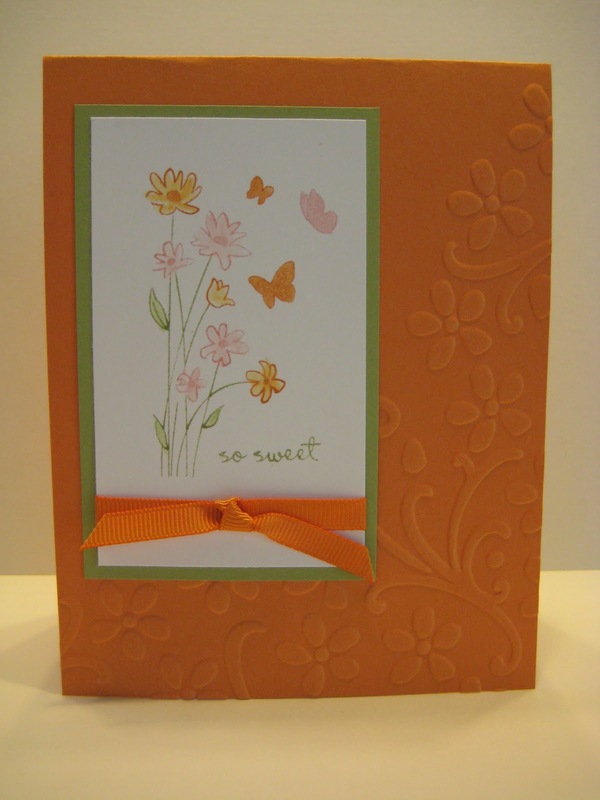 It also uses the Elegant Bouquet Embossing Folder which has always been a favorite of mine. I decided to try out Colour Q Challenge 131 when I saw this pretty combination. It's so springy and just a little different than what I would put together on my own. I'd been wanting to use my new Up in the Air hostess stamp set, and this was the perfect opportunity. I have tweaked it a bit for my upcoming stamp-a-stack using most of these same colors. You could say this is a sneak peek to my demo later this month on embossing folders. But if you are in my stamp club, you would have made this yourself. You can't see well in the picture, but the aluminum foil has a different texture on the embossed parts and really looks cool up close. Here's a fun a new technique -- if you stamp on vellum, you can use classic ink. Imagine all of the embossing color choices available to you now! Because vellum takes some time to dry, you can stamp with any classic ink and emboss with clear embossing powder. 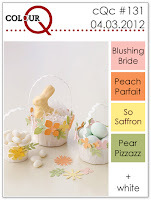 When I saw this little guy on Pinterest, I knew he was going to be on my Easter to do list. I wrapped card stock around a fun size Nestle Crunch bar and experimented with the different sizes of punches to make it work for fun size bars. Isn't this a beautiful card? The Simply Sent Everyday Elegance kit coordinates with the Twitterpated Designer Series Paper, and with a piece of paper and a little pleated satin ribbon you've created a quick but impressive card. The center piece is a sticker and holds the ribbon just fine. This was demonstrated by Missy Shipman at Stampin' Up's Leadership Convention in January. Though I didn't go, demonstrators are such a sharing group of people that I saw one made by my upline, Meg.